Last summer I really challenged myself with my 45 days of mountain biking. This year I was struggling to come up with an idea of what to do as a new and fun challenge. Suddenly it came to me . . . last year I participated in my first ever race (the NSMBA Fiver) and I thought I’d keep the fun, competitive spirit going! I have signed up for a number of enduro races this summer and have created quite the fun schedule of trips around BC and Alberta to participate in the sport I love and really test myself by being pushed to the limits. Will I win? Absolutely not! Will I finish? That’s the hope. Will I have fun? That’s a given! Of course I will be riding in between these as well. Maybe participating in some Fivers again or just getting out there for some no-competition fun. I also can’t imagine a summer would go by without a trip to Coast Gravity or Whistler as well but time will tell for those. Naturally, Ryan will be joining me on this adventure. He is registered for the races with me and is going to be a great cheerleader . . . waiting at the finish line for hours for me to be done. So far we’ve managed to negotiate which races we should register for, figure out accommodations, and estimate any expenses that we’ll come across. There was some debate over camping vs hotel vs Air BnB and while I absolutely love camping I got a bit nervous about riding a billion hour race and not having an actual, comfy bed to return to. Luckily, Ryan could see my point and we have some rooms booked up with some lovely local folks at each stop. An exciting addition is a new logo made by the lovely Kristina at Sketchy Trails. It is absolutely beautiful and I love that she captured my “popsicle nightmare” look of colourful gear. I have an order ready to get some custom jerseys printed to wear to the races and maybe one or two extra to give away. The other issue that is at hand is training. Other than the mountains being covered in snow at the moment, I’ve also run into a snag of my front brake giving up the ghost (just before a descent no less) and me scrambling together money to replace it. In the meantime, I’m hoping Ryan is okay with me borrowing his hard tail. At least my legs will get an extra workout that way! Pretty soon I’m going to be kicking it into high gear and getting out on trails as close to every day as I can. I have a long way to go before being in form for racing. The View from the Back of the Pack. I’m not saying I won’t be giving it my all. I just know how many wonderfully talented riders are going to be out on the same trails as me and I know that just finishing each race is an amazing goal for me. I fully intend to get to know some of the trail sweeps and to fall over, exhausted, at the end of each race. But through this I’m going to learn so much, meet new people, and have fun experiences to remember forever. Wish me luck, all . . . I’m going to need it. To anyone who&apos;s been reading along with my journey, you&apos;ll know that I&apos;m not great at climbing… or distance. Throughout this 45 day challenge I must say that my endurance has improved, however, it&apos;s definitely not where I&apos;d like it to be yet. Recently I was asked by the organizing team at the Innovative Fitness Adventure Challenge (http://www.ifac.ca/) in Port Moody to check out the mountain bike portion of their 3-part challenge. At first I was completely stoked. In fact, I wanted to do the whole challenge: kayaking, biking, and running. Then I took a look at the biking course and realized it was 17km and thought, "oh no what have I done?" BUT, not to be dismayed by a seemingly giant distance (I&apos;m basically toast after 4km usually) I called up my buddy Bryan (of the unicycle fame) as a road cyclist and cyclocross star extraordinare to hold my hand through this harrowing experience. When I picked Bryan up it was apparent we were a mismatch. Not including our foot and a half height difference, we were definitely geared out and dressed for different outings. The person who took this picture even said, "you two weren&apos;t riding together, were you?" Even though I was terrified of going such a distance (and so much of it steeply uphill), we set off with determination and excitement for something new. I have to say…. we had a lot of fun! Luckily on race day, the course will be marked for everyone because Bryan and I definitely got lost and had to backtrack quite a bit. Somehow we still made it to the 17km by the end and tested our exploration abilities. The trails themselves are a combination of paved and gravel walking/riding trails through the park, residential roads, and proper trail climbs complete with roots and rocks. There are some downhill segments but definitely beginner-friendly and easily done on a cross country bike. What was not ideal, however, was me on a full mountain bike and Bryan on a cyclocross bike. 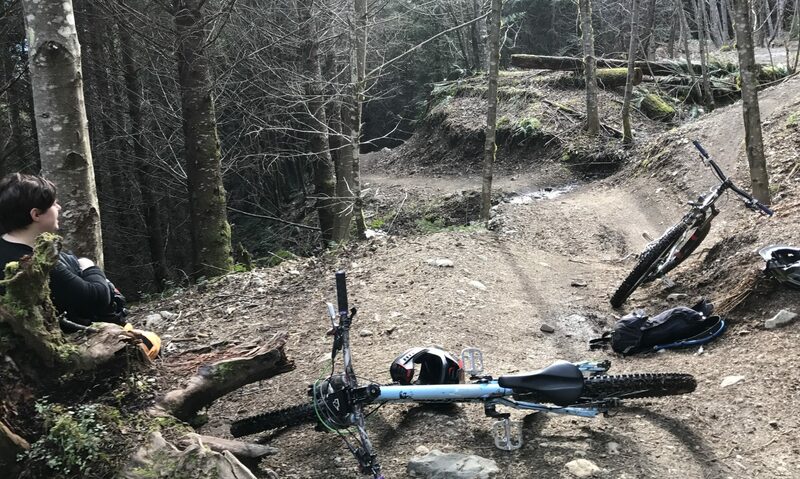 We took turns leaving each other in the dust: him climbing over flat, grippy surfaces like a champion, and me shredding anything downhill or with less traction like a bat out of hell. What WOULD be perfect is either an enduro or a cross country bike. Don&apos;t be like us. Dress and gear appropriately. There&apos;s still time to sign up for the Innovative Fitness Adventure Challenge (https://raceroster.com/events/2017/11617/innovative-fitness-adventure-challenge?target=blank) which supports two charities: Physical Literacy For Life and I AM SOMEONE Ending Bullying Society. The race itself is September 9th. If you want a fun day out with friends and a very BC way to get some exercise go ahead and sign up. If it&apos;s not your thing, come out and cheer the awesome folks who are out there killin&apos; it or donate to one of the participants. Day 28 – My First Race! The North Shore Mountain Bike Association here in BC runs enduro races called Fivers every couple of weeks in the summer. It’s a great way to get out and have some fun at any level yet still feel the excitement of a race. It’s only $5 to enter as long as you’re an NSMBA member. Through this 45 day challenge I have kicked around the idea of finding something to race but was always too intimidated. When I saw last night’s race course posted on the website, I couldn’t resist. The climb was manageable, I knew 3/4 of the trails really well, and I had a day to try out the last trail. Ryan and I scouted out the trail I’d never been on before (Oil Can) the night before the race to make sure I was actually able to do it. It was challenging but went well. Overall, I had the very achievable (I think) goal of just finishing the race before they took all the timing sensors down. If I didn’t come dead last, that’d just be gravy. While I’m still waiting for the results with other people’s times to be posted, by the looks of my Strava I went faster than I ever have before on those trails so in a race against myself, I definitely won. After nervously lining up to get my timing chip and signed in, I got on my bike and headed up. It was at that point that I realized that this experience was strikingly similar to….. just riding my bike. I will admit, knowing you’re on a timer on the actual trails probably led me to be a touch zippier than normal, but for the most part I felt calm and confident just like a normal day on the trails. Everyone was absolutely lovely. No one made fun of me for being a newbie or slower than others and we were spaced out well enough that I only had to let someone pass me once in the whole course. Ryan was waiting for me at the finish line which was the best feeling in the world. Getting cheered on and also knowing that my very tired body got to stop soon left me beaming with pride. After the race, we headed to Norco John Henry Bikes who were the sponsors for this ride. They had food and drinks and a really fun mini bike race. Yes, we got on the mini bike and raced. No we didn’t win. But it was a ton of fun and a great way to get to know the community of racers I’m in. If you have a low-key type race like this near you, I highly recommend checking it out, even if you’re nervous. If you’re upfront about your newness, I find that people are really understanding and kind. Hopefully this is just the start of my racing career and I look forward to posting more race stories in the future.